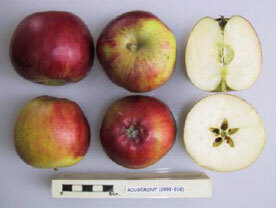 The Rougemont apple variety was thought to have been raised by nurserymen J. Cheal of Crawley, Sussex. It was first recorded in 1888. The Rougemont is a dessert apple. The fruit is scarlet, flushed, tall and ribbed. The taste is rather sour, with soft, green-tinged cream flesh. Apples ripen over a long period from August to October.